Finally, nature is at its best in North India and the first downpour has brought a big relief from the scorching summer heat. The moving clouds, thunderstorm, lightning; the changing skyline from orange, gray to dark makes the whole sky look so mystic. In fact, it seems that nature has finally used its magic wand to bless everyone. The fragrance of wet earth, the rain drops on leaves, cleansing of trees & shrubs, hazy misty weather, a breeze with rain drops caressing your face is what defines the perfect monsoon for us. And if there is a chance for the road trip during the rainy season, then it is exactly like frosting on the cake. Yes! We are talking about the monsoon road trips. As the June end’s or first week of July starts, we start thinking when and where to head for the monsoon road trips. Where never gets answered but we start chasing rains in North India, especially toward Hills of Himachal and Uttarakhand. The roads, trails, and nature start smiling with the showers and get a new life. Here are few of the reasons why we say monsoon road trips are the best ones. The rain is nature’s art and umbrella is my art. When I walk with it in the rains, I walk with a super art. I feel free to jump in the puddles and have some Chapak! Chapak moments! It was raining and the car was sailing on the curvy roads to Kasauli from Chandigarh. 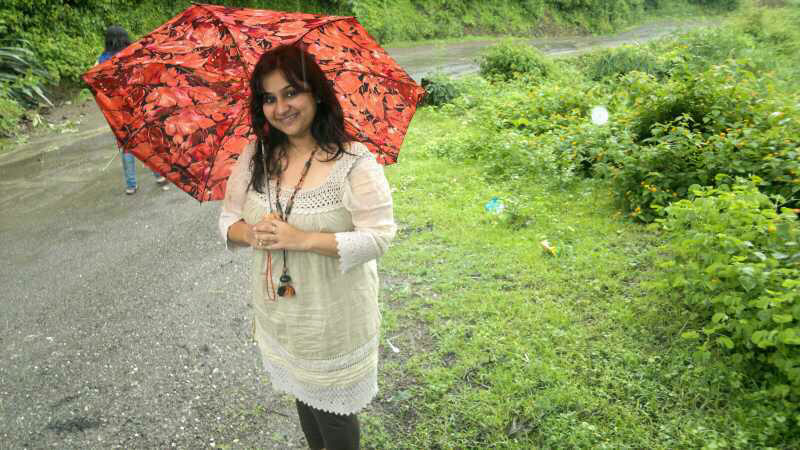 But who could stop me and my smile from getting clicked with the colorful umbrella? I never wanted this storm to pass like that, I wanted to get wet, feel the droplets and breeze. 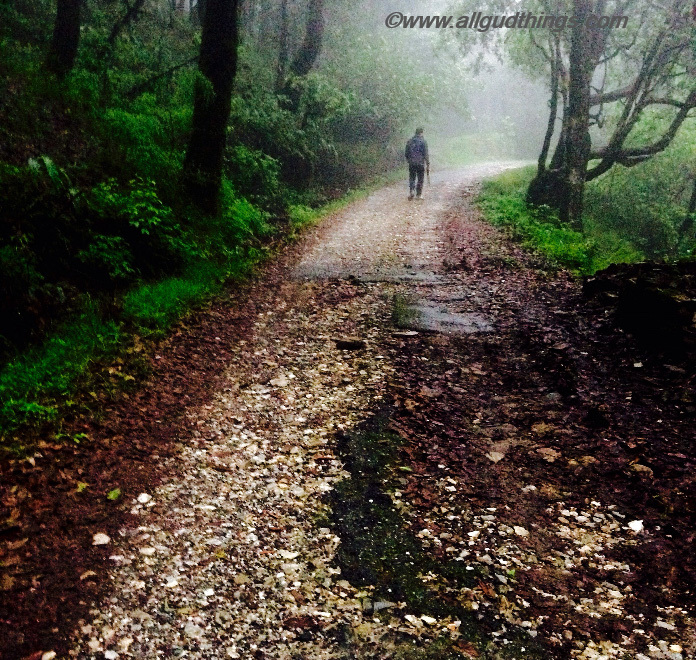 The way to Ranikhet in Uttarakhand was becoming so sensational. The roads get washed and get a make over whereas the trails smell wonderful in the rainy days. We would love to walk and drive endlessly on the clean roads in the rains. There were light mist & cool air, I opened up my arms for both to fondle. He said follow me as we walked up this trail and I did because he is worthy and the trail looks awesome – take me to the wonderland. This image was taken at Binsar Wildlife Sanctuary. The Himalayan Village, Kalpa is a heavenly abode and I think my words can’t do any justice to this image. Over every mountain, there is a path and it passes silently without disturbing the mountains. 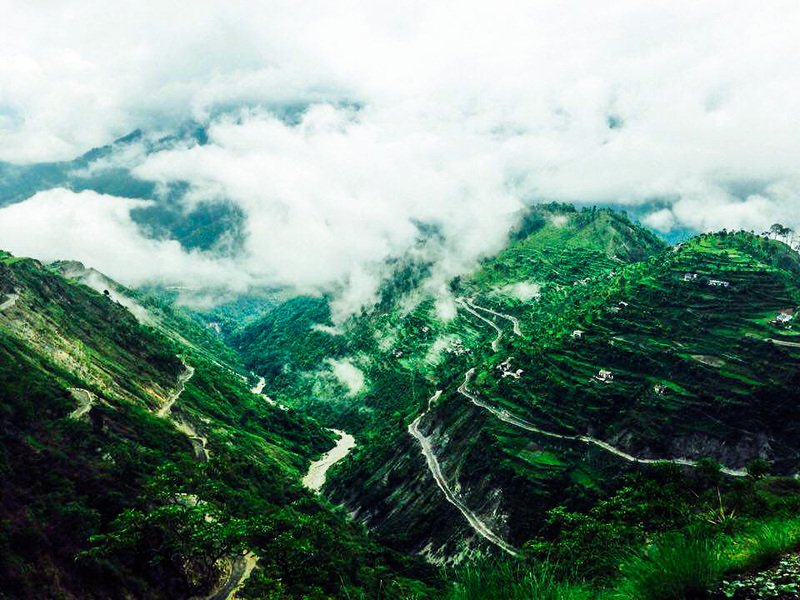 The image was clicked on the way back from Valley View Homestay Ranikhet. Trees get refreshed, flowers bloom and the Fragrance of pine and woods open up your senses. Rains only let the flowers bloom. The lush green meadows turn greener and they act as real tranquilizers. 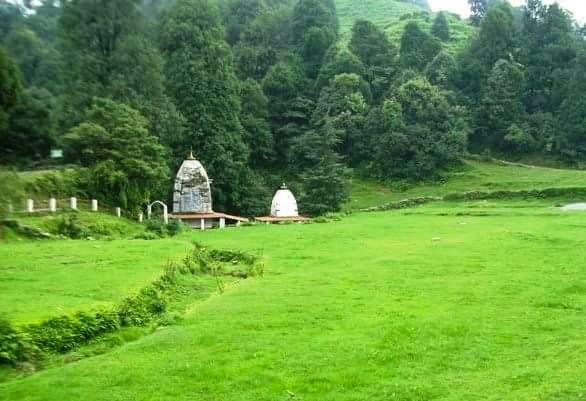 The picture is taken near the Mahadev Temple in Binsar Wildlife Sanctuary. Rainbow is always special but if you see a double rainbow along with the rains, it is astounding. See how it turns adults into kids. The very special moment captured by a fellow blogger Jitaditya Narzary; of The Travellingslacker at Manali. The colors and raindrops make your pictures look different and perfect. Isn’t it? The rivers start gurgling and sometimes you can spot an amazing sun peaking through the clouds on the banks of rivers, giving sky it’s own shading. 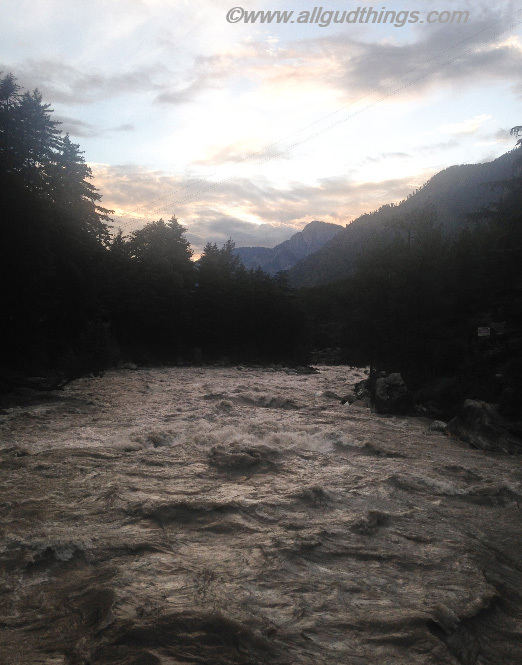 River Parvati flowing at its best during monsoons in Kasol. The seasonal waterfalls are equally charming as the all time waterfalls. We are sure these wonderful reasons and pictures might have lured you for the monsoon road trips but always remember the monsoon road trips are equally dangerous and need to be done with special cautions. You can also check the related posts 5 offbeat monsoon weekend getaways from Delhi and 5 places not to miss for monsoon road trip. 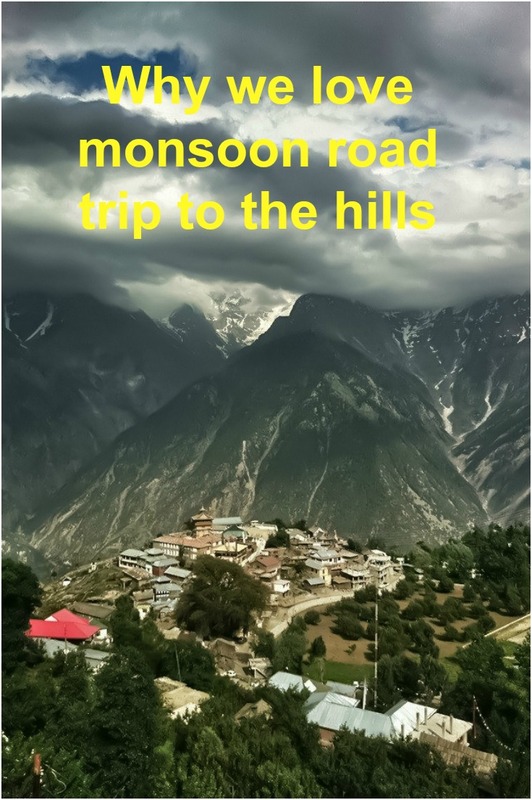 Do read the monsoon destinations in India, which should top your list. The driving person needs to be fully attentive. His focus should be just on the road with both hands on the steering. Clicking photographs while driving should be a real No! Get your vehicle properly inspected before hitting the roads. If your tires have gone bald, get them replaced. Check for wipers too and get them changed if they have become brittle. Use headlights and taillights to get a clear view as well as to make your car visible to others. There are more chances of skidding on wet roads. So, drive slowly and maintain distance from the vehicles in front. Drive along the center of the road and preferably follow the vehicle going ahead. Park your vehicle away from trees as there is a chance of electrocution of trees during lightning which in turn can damage your own vehicle. If the weather condition and storm worsens, don’t try to push yourself and your vehicle. Stop your car on the side. Flooding can occur on the highways and other streets within minutes of downpour. Don’t try to drive through the flooded areas. Rainwater moistens the brake drums so the braking efficiency gets lowered. It is advisable to use the brake on and often. Also, keep the brakes well moistened. 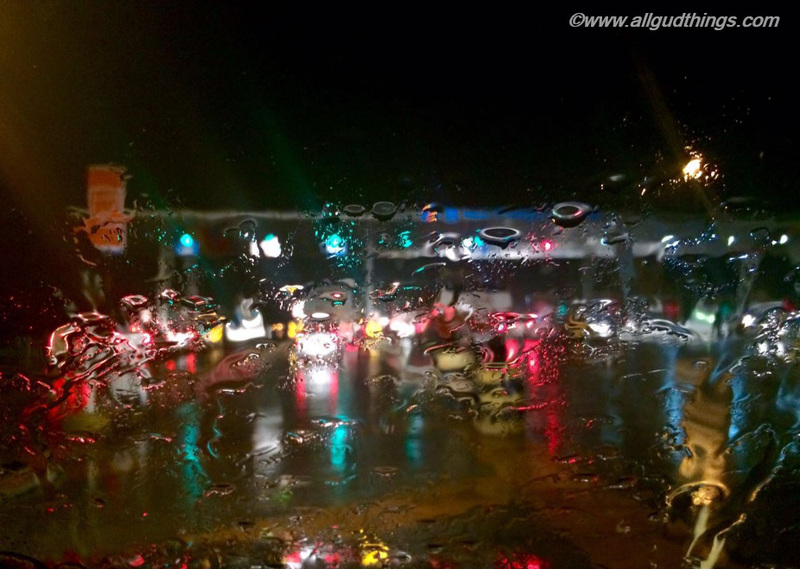 Avoid driving at night during rains. If you like it please share it and let us know where are you heading next. Tourist or Traveler – Don’t know who we are? We’ve never been to Asia during monsoon season, but it looks like it isn’t that bad after all! Thanks for sharing this! I’ve never been in a place during monsoon season. I’m not sure I would enjoy it though. It rains so much where I’m from (Vancouver, Canada), and I’m definitely not a fan of the wet stuff. Might be different where it’s warm though! I’ve heard the Indian heat is oppressive – sounds like the monsoon season comes as a huge relief! I love your take on rain being nature’s art. Such beautiful photos due to a little fog and rain. On the bright side, it’s rain and not snow or ice. I would be freaked out driving in a monsoon but I can totally understand you loving the scenery and the smell after a fresh rain. Love your photos and can see why you enjoy it! Love the smell of fresh rain. The mountains are the place where you can really unwind from the citylife. You two are so brave to travel during monsoon. I’m a bit scared because of slippery roads. Thanks Blair, we try to be extra cautious while road trips during monsoon. Monsoon in India has a charm of its own. I love the monsoon of South India and West India. 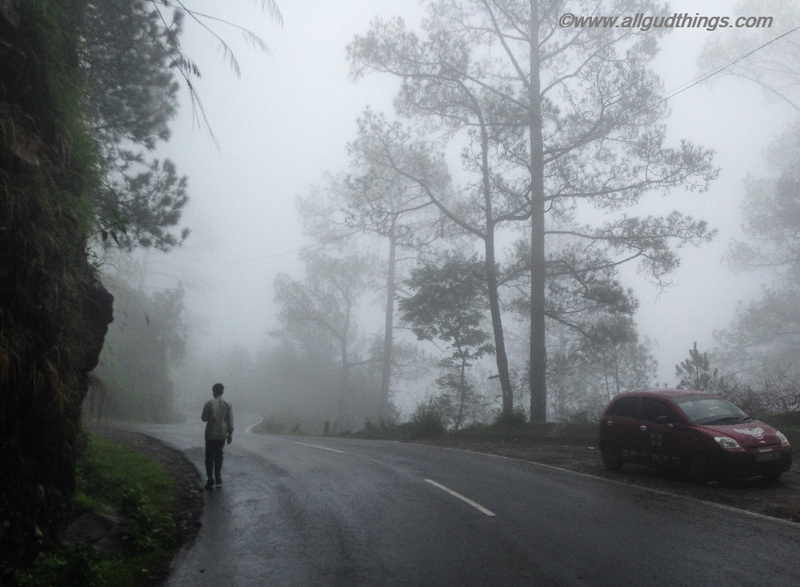 I am yet to try monsoon road trips in North India. Kalpa sounds great. The valley view homestay in Ranikhet is so serene. Lovely post, that can inspire someone who always love sunny weather to give a try to a monsoon road trip! If only I had the money to travel to India…my best friend is from there! Reading your blog post was enough for me to imagine I was there in person! WOW! What views – amazing! And I bet seeing a beautiful rainbow in a place like this is magical. Thanks Suruchi for showing the world how lovely India looks during the monsoons. It has been my favorite season of all. And thanks for listing out the precautions as well. It will really help one plan. That look of the majestic mountains with the clouds hovering over them – that is just awesome. Kasol is absolutely an amazing place. I have been there so many times and will go there back for more. Monsoon season makes a lot of places in India seem even more charming. The photos look magical! 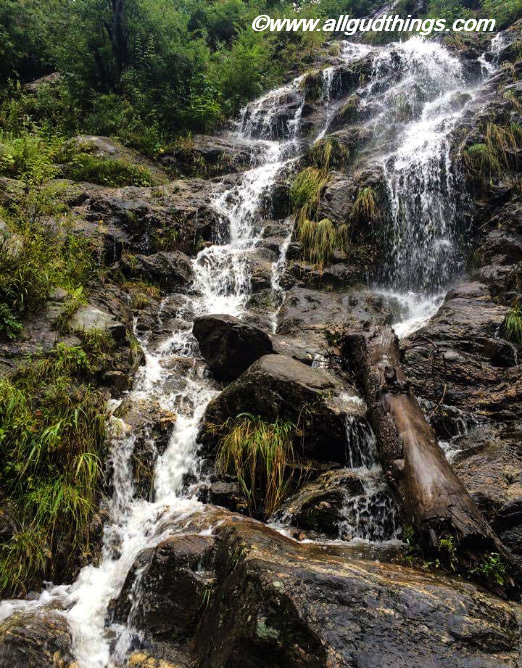 I love waterfalls, and can imagine that they are at their best during monsoon season. I’m not a huge fan of driving in the rain, so I think I’d have to do very short road trips (or very slow ones!). You really have a habit of adding a new destination to my bucket list isn’t it? This post really took my breath away! 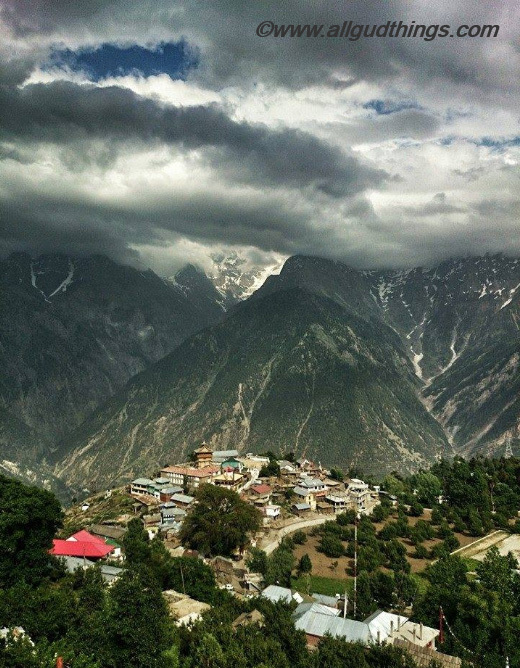 Kalpa village is a must visit! The sight was unbelievable and the shot was even better! I am glad you captured it so well! We love monsoon trips as well. Love your rainbow shot. We are planning for a couple of treks this monsoon. Do you have anything planned? As much as I love road trip in monsoon, its a bit scary too, esp in ghat roads and hairpin bends! Totally love your rainbow umbrella! Looking to get one since quite sometime now! 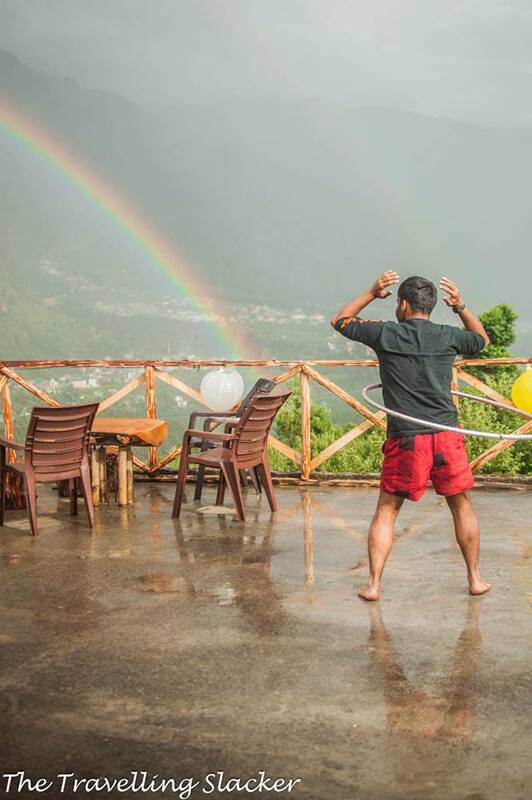 Totally love the shot of the rainbow at Manali! The Hinalayan is so sureal! Im speechless! And traveling on a moonsoon is pretty hard! Wow, it all looks so mystical and mysterious! I never traveled around India during the Monsoon but I see that it is totally worth it for the experience and of course photos. Monsoon road trips are always the best! Love your photos, especially the view from the top of the mountain. I love monsoons and I love road trips…in essence I love road trips in monsoons! 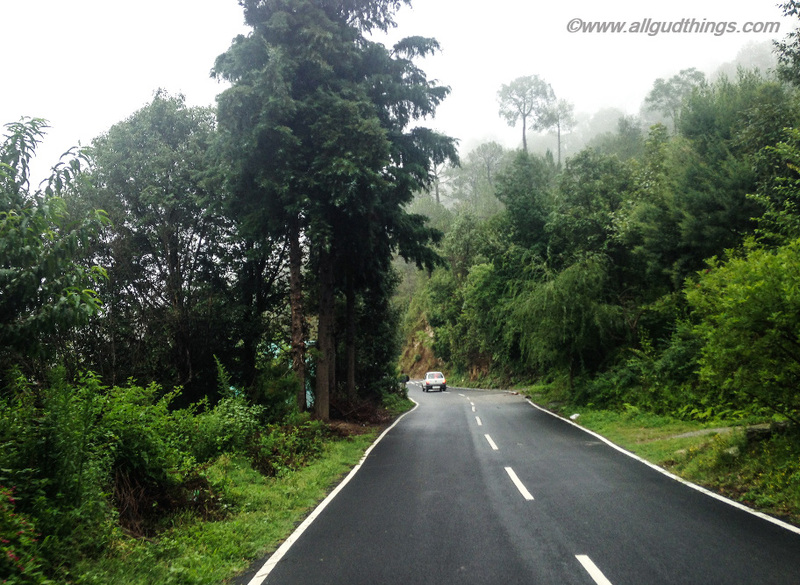 The vivid green freshness and the mist are the best part of monsoon road trips. Now you’ve reminded me that Ranikhet is on my agenda. So true! Monsoon is my favourite time of the year for more mountains and road trips! As uncomfortable as it may get, the thrill of a trio when it pours is a different world altogether! I also love monsoon, I know many people who hate it because it’s such a hassle to travel when it’s raining, but not me. I love it. And I can definitely why you love taking road trips in this weather, just looking at your photos, gives me the warm fuzzy feelings. Monsoon is a time when Nature seems to dance to an exhilarating divine music. Driving through the beautiful landscapes of Northern India in the rains is indeed an experience on an altogether different plane. Loved reading your post and looking at the lovely pictures, the fragrance of the earth mingling with the rain seems to permeate the post. Great post. I love the rains and hills in rains are heavenly. Extra Caution needs to exercised while driving on hills during rains as many unexpected things may happen – like road block due to land slide etc. hmm… Himachal Uttarakhand.. how far is it to Himachal Pradesh? And which one do you prefer? I love road trips too, but only if I have enough time to do that. 🙂 Have fun and happy traveling. Himachal is Himachal Pradesh and Uttarakhand is another state. These two states are just adjacent to each other. I love both but these days I am inclined more towards uttarakhand. I’m not a big fan of monsoon season and in Florida, we say, it’s a hurricane season! I feel sad to see the number of road accidents increasing drastically during this time of the year. But loved your pictures and the scenery is quite splendid! Wow, I’d love these roadtrips too if I were you. It’s absolutely my favourite way to travel, and it seems like it might be yours as well! Your photos are gorgeous and so enticing. I don’t know that I’d undertake this trip during monsoon season, but I would love to visit someday. 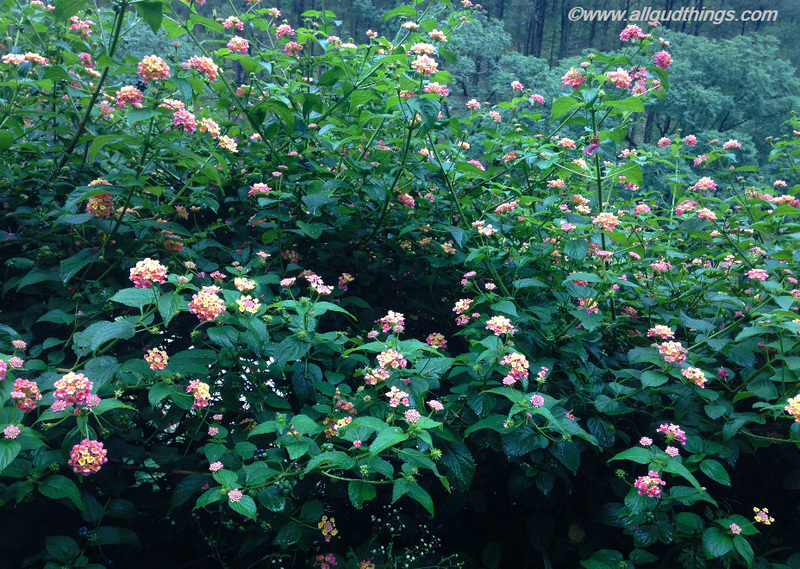 I was blown away by the photo of flowers that we can lantana appeared to be growing wild – here I have to buy them in the store. Gorgeous photos, especially that of the mist — seems ethereal. Love the pictures. It looks like my kinda scene. I would love to experience the monsoon rods one day. The mountains, rivers, and natural terrains are just incredible! I’d love to visit someday. Beautiful shots! Looks like a great place to explore soon! Now this is something I could never do. First off, I am very afraid of heights and cliffs. The photo with the mist is very gorgeous! It’s interesting how you prefer the rain! I like this unique way of looking at tracking. But it’s actually pretty dangerous to go up the mountains when they are wet and you might injure yourself! Be safe thou! Wow the views area amazing! Looks like a great adventure! I’ve been wanting to visit India for a while now, it looks like such a gorgeous country! Such a wonderful post. Thanks for sharing this awesome post. Sometimes it nice to get out when it’s raining roadtrip or even go for a hike, the surroundings looks fresher and greener great for photography but We needto take a lot of precautions when driving roads get slippery and mote dangerous.